The Information and Communication Technology (ICT) sector in a number of Pacific Island Countries (PICs) has undergone significant liberalization and privatization, coupled with the deployment of undersea fiber optic cables, over the last decade, leading to a rapid increase in access to mobile voice and data networks. 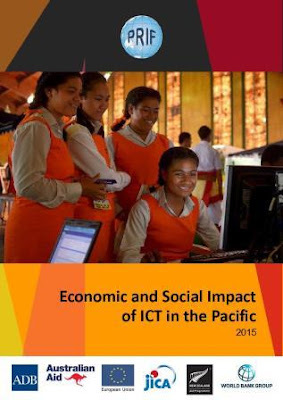 The PRIF study on the Economic and Social Impact of ICT in the Pacific was commissioned to review the social and economic benefits of these developments and to identify interventions to further leverage and foster this development. The study comprises five country case studies: Fiji, Samoa, Solomon Islands, Tonga and Vanuatu, and a Comparative Report that distills lessons and identifies areas for further investment and support.